The Royal Academy of Cambodia on Friday held a roundtable meeting to discuss the dissolution of the former opposition CNRP and speculate on the return of Sam Rainsy. Cambodia said on Monday that the air quality in the kingdom has not been affected by smog in neighboring Thailand. Preah Sihanouk provincial military policeman has been suspended and placed under investigation, while a search is underway to find the weapon used to shoot a man. – seriously injuring him – during clashes in Prey Nop district on January 24. Cambodia Angkor Air, the national flag carrier, has made the Chinese market a priority, aiming to capitalise on the growing numbers of Chinese tourists to the Kingdom, a company representative said. The son of Prime Minister Hun Sen on Saturday chided former opposition leader Sam Rainsy for ruining peace in Cambodia instead of contributing to the country’s development. JAPANESE consumers stand to benefit from the Japan-EU economic partnership agreement (EPA) that went into effect on Friday, with prices for such European products as wine and cheese set to fall. A celebration of culture, handicrafts, arts, and food will grace the streets of BKK3 in the form of a tented festival. In the wrap-up session of the third cycle of the Universal Periodic Review (UPR) for Cambodia in Geneva, Switzerland, on Friday, 73 countries made a total of 176 recommendations to improve Cambodia’s human rights record. In a move to facilitate trade and reduce costs for businesses, the Ministry of Commerce on Friday issued a sub-decree that puts an end to the presence of Camcontrol in border checkpoints. A conservationist group on Monday applauded the Cambodian government’s decision to officially approve the management zones of Srepok Wildlife Sanctuary in northeastern Mondulkiri province. National Committee for Disaster Management (NCDM) spokesman Keo Vy on Sunday said attempts were under way across eight provinces to rescue 23,000ha of dry-season paddy from drought. Three districts in Battambang province were facing emergency levels of severe drought, he added. Japan-Cambodia Interactive Association (JCIA) is interested in establishing four Cambodian cultural villages in Japan, according to the Ministry of Labour and Vocational Training. The Ministry report shows that Cambodia was able to produce just 400 tonnes of vegetables a day in 2018, which means that about 140 tonnes had to be imported daily, mostly from Vietnam, Thailand, and China. Cambodia has promoted its tourism at the 23rd East Mediterranean International Tourism & Travel Exhibition (EMITT) in Istanbul, Turkey, to attract more Turkish and European tourists. The National Bank of Cambodia and the Bank of Thailand yesterday signed a memorandum of understanding (MoU) to cooperate in a QR code payment system that uses both Cambodian riel and Thai baht. Cambodian Human Rights Committee president Keo Remy on Friday hailed his attendance at the United Nation’s Universal Periodic Review in Switzerland as a success. Last Thursday, January 31, the US Embassy in Phnom Penh released a statement that claimed, “We would like to highlight that the US was not involved in the coup leading to Lon Nol coming to power. Minister of Water Resources and Metrology has received Country Director of Asian Development Bank (ADB) for Cambodia, Ms. Sunniya Durrani-Jamal for cooperation discussion. A Battambang villager discovered 187 mortar shells on Friday, while a 500lb (227kg) US-made MK 82 bomb was safely removed by the Cambodian Mine Action Centre (CMAC) after being unearthed in Sihanoukville’s Commune 1 on Thursday. 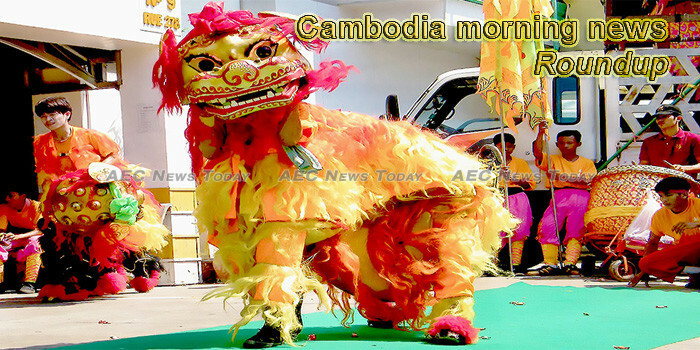 This week’s Cambodia morning news feature photo acknowledges Chinese New Year, 2019.